Curiosity rover, the popular name given to NASA’s Mars Science Laboratory mission, is so far the most sophisticated spacecraft ever sent to Mars. It landed on August 2012, and since then it has been exploring the crater Gale, near the Martian equator, and the central mount in it, Mount Sharp, having traversed by the time being some 16 km. During these years, Curiosity has contributed remarkable discoveries about the Martian environment and history, which have meant a great advance in the knowledge of the planet. Curiosity’s explorations have confirmed that Mar had large bulks of liquid water on its surface for long periods of time (in geological terms), and provided the sets of data which allowed to conclude that there is a cycle of water exchange between the ground and the atmosphere with a phase during which perchlorates brines remain liquid. It found native organic compounds, fixed nitrogen and atmospheric methane, opening interesting investigation lines to follow in the search for traces of past or (even) present life on Mars, such as ExoMars missions will do. Rover Environmental Monitoring Station (REMS), is one of the instruments of Curiosity’s scientific payload, and it is basically a meteorological station which records the value of several atmospheric parameters such as air temperature, wind speed and direction, pressure and relative humidity, as well as ground temperature and incident ultraviolet radiation with the correspondent sensors, which are spread on different locations over the rover. 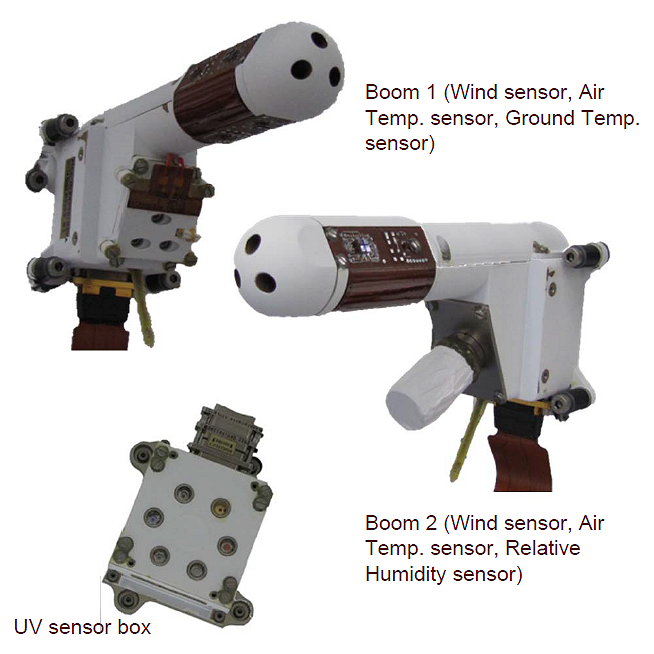 Wind speed and direction sensors (WS), air temperature sensor (ATS), ground temperature sensor (GTS), and relative humidity sensor (HS) are located in two short booms (named 1 and 2) attached to the mast of the rover. 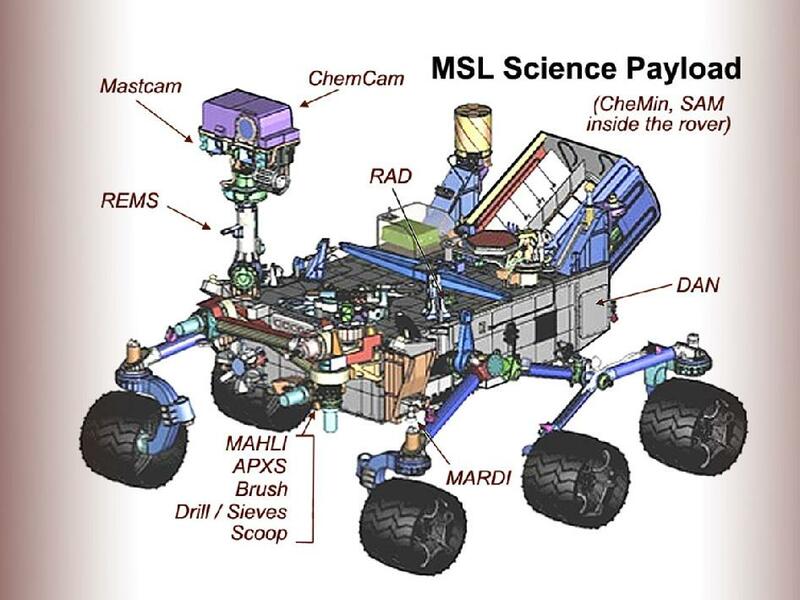 Pressure sensor (PS) is located inside the Curiosity’s body, opened to the outside by a chimney on the upper platform of the vehicle and, also in this platform, near the mast base, is the ultraviolet sensor, composed by six photodiodes to measure different bands of the spectrum. All these sensors measure in an autonomous way, with a hertz frequency, during five minutes per hour throughout each Martian sol (Martian day), plus between one and three hours of continuous measurement that are added daily to the operations schedule. REMS is the first instrument of its kind on Mars, and then, it is mounted on a mobile platform. That has allowed it to collect the most extensive environmental data sets so far, in whose scientific exploitation the Atmospheric Science Group is involved since the beginning of the mission. Remarkably, the environmental sensors composing HABIT’s ENVPACK unit are inherited from REMS’ ones, and they share the same measurement regime, what will mean an extension of the atmospheric records both in time and space, since they will measure on a different location.